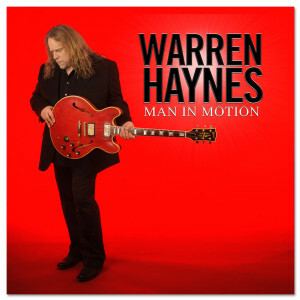 Cover of Warren Haynes solo album, "Man in Motion"
I only knew Warren Haynes, one of Rolling Stone’s “Twenty-five best guitarists of all time,” as a member of the Allman Brothers, so I was very pleased to catch this NPR interview on Sunday morning. In addition to the Allman Brothers and The Dead (that’s the Grateful Dead, minus Jerry Garcia), Haynes plays with his own band, Gov’t Mule, but over the last twenty years, certain songs haven’t fit with any group, and this prompted him to record a solo album, “Man In Motion,” which was just released today (May 10, 2011). In the interview, Haynes discusses the music that has influenced him, from the time of his boyhood in Asheville, NC, when African-American gospel music on the radio “made the hair on his arms stand up.” Man In Motion was recorded in just six days; Haynes wanted to keep the emotions fresh and not belabor the music. The interview featured clips of three songs, which I very much enjoyed. Right on schedule, “Man in Motion” is available on iTunes this morning. I sampled a couple of cuts but have not yet had time to listen to all the clips. The song I most wanted to post here is not up on youTube yet, but here’s something to entice readers to check out the new album: a wonderful clip of Warren Haynes with Gov’t Mule last summer, performing, “Soulshine.” Enjoy! Footnote, Saturday, May 14. I downloaded the whole album and have been listening for the last few days. I can’t really find any false notes. It’s great music and the dogs like it too (dogs and music will be a separate post). If the description and the clip interest you, check out the cuts from Man in Motion on iTunes or youTube. Bet you can’t keep your toes from tapping!